A unique cookbook featuring our family comfort foods - Italian, Asian, Mexican, Soul Food, American Traditional & more. The author has compiled her family favorite recipes gathered through generations, traditional favorites with a special twist, and creative new recipes. 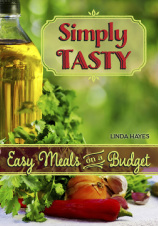 The recipes are easy to follow, budget friendly, and simply delicious. Hayes uses a think out of the box approach to cooking that creates dishes that will become your family favorites and party hits. Her recipes include appetizers, side dishes, main dishes, kid meals, drinks, and desserts. As an added bonus she has included inspirational quotes and thoughts to make your cooking experience extra special.